Last week, most influential bloggers relayed the information about IndexTools being rechristened as Yahoo! Web Analytics. Dennis Mortensen reputation and charisma are legendary, so it was easy to mention it. Dennis even took the time to send me a personal note saying "As you tend to be first with news and as I wanted to make sure I remembered to let you know, so we can be in WASP with the new code". When I saw how many other bloggers were enthousiastically talking about Yahoo! Web Analytics, I figured I could wait a bit instead of just doing a "me too" post. So here's my slant on IndexTools, I mean, Yahoo! Web Analytics. I have used or implemented several of the leading web analytics solutions but never had the chance to play with IndexTools. I'm grateful to Miles Bennett, an Indextools Alliance Partner in the UK, who provided me an account for my site so I could see the power of Yahoo! Web Analytics by myself. It's been just a couple of days since I tagged my site, but I can already see why so many people are raving about this solution. Beyond what anyone would expect from a web analytics solution, there are some very powerful features like the dashboards, custom report interfaces and segmentation capabilities that raise the bar for any other free (and some for-a-fee!) competing products. I just played a bit with those features, but this is definitely a difenrentiating factor, and a big one! 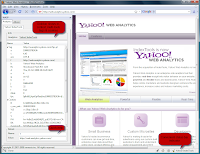 Of course, WASP detects Yahoo! Web Analytics correctly, as well as about 120 other solutions (click on thumbnail for bigger view...). The upcoming release of WASP will make it even easier to do quality assurance of your web analytics implementations by easing the crawling process and offering enhanced reports.